Inspired Artisans was established in 1997. Inspired Artisans is located in Milwaukee, WI. How many artists are employed by Inspired Artisans? We currently have a staff of two full-time project managers and three full-time, in-house artists and designers. In addition, we have strong connections to numerous artists on a commission basis that allow our studio to create projects in a larger variety of media. Do you create only religious artwork? While we have maintained a reputation as a custom design studio for religious organizations and communities, we have provided many secular solutions for our clients as well. We look forward to all opportunities to design, install or restore custom art work. What types of clients have you served in the past? 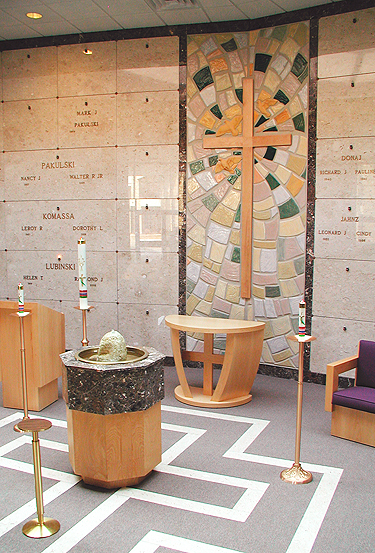 Our studio has served a large variety of clientele, including religious, civic and institutional organizations, as well as many cemeteries and some private clients. What steps are involved when you design a custom piece of art? Our first step is always to listen to clients to a get a good idea of what their needs really are. We then create a series of ideation sketches and work with our client to develop a final design – throughout this design process we do our best to produce work that meets the unique vision of each of our clients. Once a final design is approved, the art is produced in whatever media desired and the completed piece is then either installed by us, or in cases where distance is a factor, installed by client under our advisement. Finally, at the end of each project we take time to celebrate with and thank our clients for trusting us with the important task of creating their custom art. What is the largest project(s) you have ever completed? All Saints Cemetery in Des Plaines, IL, where we completed four 7’ x 28’ murals of Our Lady in mosaic and glazed ceramic for the 50’ tower of a new mausoleum. 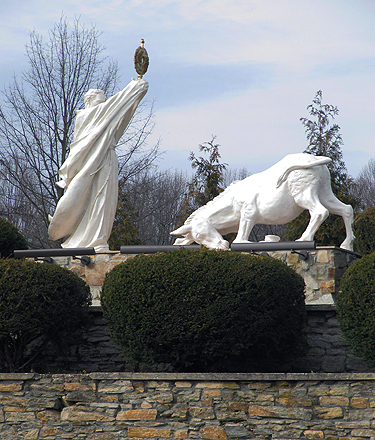 Holy Sepulchre Cemetery in Coram, NY, where we completed numerous etched glass windows, stained glass, exterior mosaics and a sculptural reredos depicting the Scene at Calvary for a new mausoleum. St. Martha Catholic Parish in Kingwood, TX, where we completed numerous hand-carved, linden wood sculptures, a tabernacle and a 12’ x 12’, Welcoming Christ mural in mosaic and glazed ceramic for their newly constructed church. I have a limited budget. Do you provide less expensive alternatives to meet my needs? Yes. We’ve become very good at working within and providing design options to meet the needs of a modest budget. Do you do restoration or repair work? Yes, to a certain degree we do, however if the work to be completed is beyond the scope of our capabilities, we have many resources to help our clients connect with a craftsman who can complete the project. Can you recreate an existing piece of art? Yes we can. On many occasions our studio has been commissioned to create replicas of various works of art that have either been damaged or simply need to be re-sized for a new setting. What material options are available for sculptures? We can work in wood, marble, bronze or fiberglass. The choice of material used is primarily driven by budget, but other factors, such as where the sculpture will be displayed, also come into play. Bronze is the most durable material and is suitable for both interior and exterior applications. 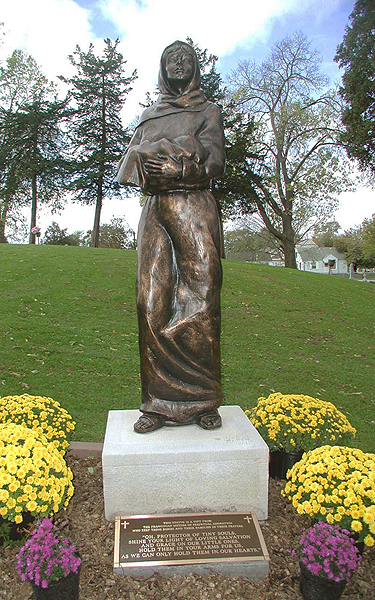 A sculpture of the same size in wood can be two-thirds the cost of bronze, and fiberglass only a third of the cost, but there are limits to their abilities to withstand the elements. For instance, fiberglass is only acceptable for exterior use if a special coating that either mimics bronze or white marble is used to provide a durable, protective finish. What is the time frame to complete a custom 6’ sculpture? From concept to installation, the time frame is generally between 6 to 9 months. Inspired Artisans can help you design and create your new works of art.